Once AGAIN, BARACK OBAMA EXCLUDES the FEMALES as he POUNDS DOWN a COUPLE of WHITE HOUSE BEERS with his MATES, CROWLEY and GATES. Barack Obama's pattern of dismissing women's contributions to real life situations has reared its head again. The latest controversy involves an african american Harvard College Professor/homeowner and a white policeman, and two unsung female heroes that were completely ignored by Barack Obama, Michelle Obama, and the White House. Ironically, the people being taken off the bus and marginalized in this latest public imbroglio are neither the overemotional home owner, or the police person doing his job. The two people who have been marginalized regard GatesGate were, women! According to Lucia Whalen, the woman who actually called 911 to report two men trying to barge into a home through a closed front door, she was first told about the suspicious break in by an elderly woman. "I just saw it from a distance and this older woman was worried, thinking, 'Someone's been breaking in someone's house. They've been barging in.' "
Both women were BRAVE ENOUGH to witness (and yes, it takes bravery to witness a possible law breaking act that is occurring since you may be seen by the perpetratorssss) a possible break in, keep their cool, yet Lucia Whalen had to keep walking on by while observing the two potentially hostile creatures (edit note - the phrase "possibly hostile creatures" refers to anybody on the planet that one would feel justifiably fearful of approaching to ask a question). THEN, at some strategic distance past the home that looked like it might be being unlawfully entered, Whalen had to CALL 911 to report what she saw. The reward both ladies received courtesy of Barack Obama was to be ignored by Barack Obama. lol, maybe being ignored by Barack Obama IS A REWARD. Barack Obama's first response to the original Crowley vs Gates issue was to create a racial divide where one DID NOT HAVE to exist. Naturally, Barack kisses and makes up with the men, and only the men! Men, Men, Men, Men, Men, manly Men, whooo hooo, hooo hooo hooo. Mennnnnnnnnnnn. (reference is the theme song from 2 1/2 men). Our president attempts to show everybody how much of a peace maker he can be by inviting the TWO MEN to the White House so Barack Obama can solve a problem HE ESCALATED himself! But were the women who called in the report invited to the white house? Nope. "Well, we were going to invite them, but I was told that if we put aprons on them and had them serve us the beers that some people might think that was uncouth." (sarcasm alert). Maybe timing is everything. Barack Obama was ridiculed for his throw to home plate before the All Star Game. His jeans were made fun of as well. In both instances, he was compared to a girl. Not that there's anything wrong with that. So imagine if Barack Obama had invited both women to the White House instead of the men. You know what, it's STILL NOT A STRETCH OF THE IMAGINATION to imagine Barack Obama inviting the two ladies INSTEAD of the two men to the White House. Honoring people who care enough to get involved, even when they themselves may not have the physical strength to fend off two people behaving oddly, who could notice them looking and attack them, is HEROIC. So much for the "taking personal responsibility and doing your part to help make your own neighborhood a better place" speech that Barack Obama likes to give in inner city areas about How to make your own neighborhood better by actively participating. And where was Michelle Obama to step in and perhaps offer to host a meeting a the White House with these two very brave, and very caring ladies? (hint, hint alert). If ever there was a time for clueless women who voted for Barack Obama rather than Hillary Clinton to be gently grabbed by the collar and mildly shaken by their fellow woman and asked WHY? WHY?, now may be that time. What were you female OBOTS thinking? For Fun Only, Mattress Dominoes! I hear some people were recruited by asking them to bed, (kidding). Help Wanted, Mattress Domino Resetter, apply at Benson's for Beds, Guinness Book of World Record Holder Wannabees only should apply. Simplifying the Barack Obama Citizenship Issue even as Media Matters Attacks Lou Dobbs for bringing the discussion up on his Television Show. CLICK HERE TO SEE MEDIA MATTERS ARTICLE. 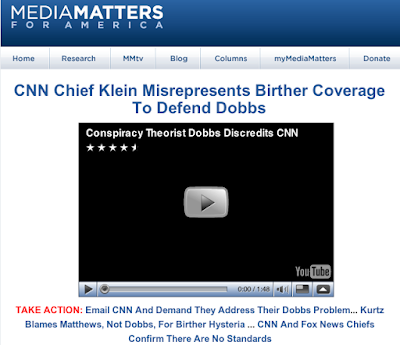 Apparently, Media Matters is outraged that Lou Dobbs brought up the Barack Obama citizenship issue. "How dare he", Media Matters is complaining, "time to shut up Lou Dobbs" they chortle. I propose a different idea. Can we talk LESS about WHERE Barack Obama might or might not have been born, and focus some discussion on the citizenship status of Barack Obama's FATHER? Can anybody explain what Barack Obama's father's role is in determining whether or not his son can be natural born or not? Is there any behavior or action that a father can do that would negate his child being considered a natural born citizen even if the child was born in the United States? Think about all of our past presidents. How many past presidents had fathers who became US citizens BEFORE their sons ran for Vice President or President, the fathers REMAINING US citizens for the rest of their lives, or until their son ran for president? If the answer is ALL OF THEM, until Barack Obama, then "Houston, we have a problem". If Osama Bin Laden had been a US citizen earlier in his life, then recently snuck back into the United States and fathered a child, and then snuck back out, leaving the child behind, would that child still be considered a natural born US citizen? If the answer to Osama Bin Laden fathering a child on US soil and the child is declared a U.S. citizen, but NOT a natural born citizen, then other scenarios, involving ALL FATHER'S behavior and motivation, exist as well, and some of these scenarios may relate to Barack Obama's own father as well. A lot of energy is being spent on where Barack Obama was born and almost none appears to be being spent on Barack Obama's father's path in life. Why Infrastructure Projects are a hit and miss proposition when it comes to Stimulating the economy. Yes, infrastructure projects are a necessary part of government. The problem is, we can't use the acceleration of infrastructure projects to help the economy, unless something else is also done. I'll get to that something else momentarily. Infrastructure projects should be a constant, steady part of the budgeting process on a yearly basis. To suddenly say we need massive infrastructure projects wrapped inside of a stimulus package means we either are creating busy work, or government skimps on infrastructure projects year after year. Creating busy work is ok, but NOT when it uses too many resources that could be used to create new job streams and new technologies. As for our government not spending the proper infrastructure budget on a yearly basis, that means the money that was supposed to be spent on infrastructure every year, has already been spent elsewhere. So now we are paying TWICE for the same infrastructure project, and therein lies the problem. Paying twice for the same infrastructure project, the first time the money was reallocated elsewhere, is not a good deal and DOES NOT stimulate anything that would help the economy. There is a solution to avoid paying twice for the same infrastructure project. Any infrastructure project that was previously delayed so money could be reallocated elsewhere, CAN ONLY BE DONE NOW IF IT IS COMBINED with a NEW, PROGRESSIVE, INFRASTRUCTURE PROJECT that is generally regarded as helping save energy or resources, or create new products that save energy and or resources. So if there is bridge that needs to be refurbished, FIND SOMETHING that creates energy efficiency that the refurbished bridge connects to. Will the refurbished bridge support other types of transportation besides automobiles? If the refurbishing of the bridge will also create an improved route for other forms of transportation, such as electric bicycles, joggers, and pedestrians, then it becomes an infrastructure project with an obvious purpose other than just trickling down money to us minions on projects that don't make us feel connected to improving our countries method of operating. YOPLAIT YOGURT New Plastic Container Can't be Stacked when Empty, How Can We Save the Planet When we can't even Stack our Recyclables? The original Yoplait Yogurt Container pictured above was narrower, taller, and upwardly tapered. The upwards tapering towards the opening did not allowed for the empty containers to conveniently be stacked inside of each other for a more concentrated disposal/recycling of the plastic containers. As you can see from the picture above, the newer Yoplait design has no tapering but the result is still the same, ONE CANNOT STACK the empty containers inside each other. 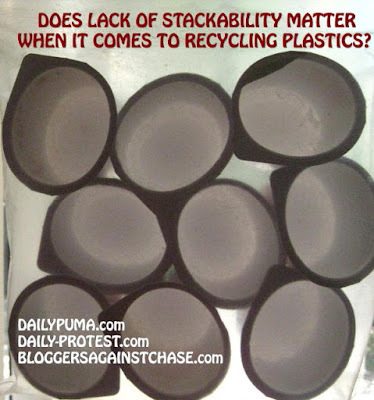 Is empty plastic container stackability a big deal? The Image above showcases how Yoplait yogurt empty cannisters would be bundled together, but not stacked, for purposes of recycling or as garbage waste. Would it not be better if these nine empty containers were put inside of one another so they took up a lot less space? The Yoplait container design means it might take as many as 5 recycling trucks to transport unstackable yoplait yogurt containers that if stackable, could fit in maybe as little as one recycling trash truck. (I am taking an educated guess). On top of that, the non stackable Yoplait yogurt containers will require many many more plastic bags and paper bags to contain them for recycling purposes. But there is more to this story, which is why efficient recycling is such a difficult task to successfully achieve. Even though the new containers are vastly inferior from a stackability point of view, when the new yoplait containers are being shipped to the stores, Yoplait is actually more efficiently shipping original yogurt product per each shipped box because there is less air in between the yogurt containers. Did Yoplait Yogurt sell out the environment so they could increase their product shipping weight efficiency? The previously tapered plastic container design, when filled with yogurt and sealed in a shipping box, could not stack as densely as this new design. Yet neither design allows for stackability AFTER the yogurt product is CONSUMED. Could this be one of those corporate mumbo jumbo, "one hand does what it wants to so it creates better results on paper" even though that corporate hand is actually cutting off three fingers on the other corporate hand that represents another part of the companies less "important" responsibilities involving recycling? 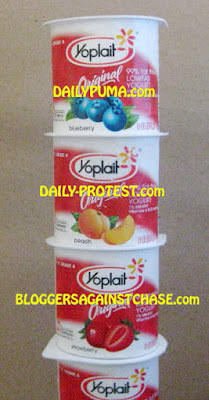 The picture directly above showcases a Yoplait plastic container that is stackable. Ironically, this is a LARGE CONTAINER of Yoplait Yogurt, and in combination with its stackability, may be VASTLY more environmentally friendly than any of the other Yoplait designs. Once empty, the large yoplait container can be reused in a variety of ways, including as a "seeder" to grow seedlings into small plants for your victory garden. Or, to be used as a small water container so one can use water more efficiently by filling the container and then walking over to the intended watering target, rather than walking an always on water hose that just spews the water every which way. Is plastic stackability a key component to making recycling more effective and efficient? Manufacturers that use plastics for their smaller products ideally should allow for their product to be recycled by either first being so soft that they can be smashed into a much smaller size, or by being stackable so they can be stored in a more dense state. Well, I found this article about the wonderful world of plastics reuse. Apparently plastic recycling is not considered a good idea and is not really as feasible as we would like to think. What is considered a good idea is plastic "refillability". Can a plastic item be refilled several times before it is discarded, recycled, or reused? If the plastic product can only be used once, before it is discarded, then that apparently is a very inefficient use of that plastic product. Plastic Recycling only truly occurs when an item can be regenerated into exactly what it already was. Many times what we believe to be recycling is actually a ONE TIME RE-USE of the product into a farther down the recyclability chain container. Since plastic is rarely if ever used to make the identical plastic component again, the continued demand for new plastic production may never actually go down. 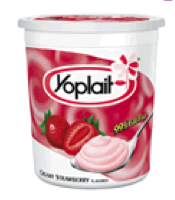 A Yoplait Yogurt container might never comes back again as a Yoplait Yogurt container, nor will it come back as anything else that is as recyclable as it was when it was the Yoplait Yogurt container. If the Yoplait container doesn't end up in a landfill, it could end up being melted into a NON-RECYCLABLE plastic product such as a plastic parking bumper in a parking lot, a plastic wheel barrow, or a big plastic garbage dumpster, used for, ahem, recycling. But getting back to plastic stackability, besides the issue of recycling our plastics, I believer there is an advantage to making our plastic products stackable so they just don't occupy as much space inside of a big heavy truck that is supposedly taking the plastic for recycling? What does this have to do with DailyPUMA? In a way it has a lot to do with Daily PUMA. There are huge discussions going on about global warming, carbon credits, and so on. Yet if we can't figure out how to best use plastics, how can we figure out more complex issues? Which leads me to health care coverage. If our economy relies on indenturing the non rich into overproduction so that enough wealth can be created to pay for health care, we will continue to overuse our share of the worlds resources even as more and more countries reach out wanting theirs. If we cannot create a maintaining economy that provides enough opportunity for everybody, we can't realistically provide health care coverage for all, either. The HILLARY'S VILLAGE FORUM TOPIC. YOU CAN LEAVE MESSAGES FOR EACH OTHER ON THIS TOPIC. Click here for most recent DailyPUMA article. I don't know what happened to Hillary's Village. Any information that you wish to share with the rest of Daily PUMA readers, or for other Hillary's Village posters, please do so here in the comment section, (over sixty comments now). You can post anonymously if you don't have a google account. (update, Jan. 22, 2013) I apologize, I have had to disable the anonymous function because of too many ad based posts in general. Is Chase Bank playing favorites, allowing some customers excellent solutions to their monthly minimum payment increase while others get nothing? BREAKING NEWS, You Chase Bank Victims who Voted for BARACK OBAMA, EXPLAIN THIS NEW YORK TIMES STORY to me, PLEASE! Goldman Sachs Sacks of Gold, How can you OBOTS explain this Glenn Beck Video? The TEN DOLLAR CHASE BANK CREDIT CARD PAYMENT PROTEST CHALLENGE by MIDDLE CLASS AMERICAN JOE. Are the Banks Gaming the System the Same Way Barack Obama Gamed the 2008 Democratic Nomination? ... the BANKS LOST MONEY on THEIR CREDIT CARD and HOME MORTGAGE DIVISIONS! ...Barack Obama whispering to the bankers, "It's better to spread hope than fear"... or, maybe it is the bankers telling Barack Obama, "Just make it sound like we have profits", that is the most important thing." Isn't it funny how on the one hand, things have been getting better for months, but on the other hand, if things ever do get better, Barack Obama will chortle that "it was a long, tough road, but I, er, we made it!" What isn't funny is lying to the american people because it just puts off dealing with the real issues. The real issues are one trillion dollars of consumer credit card debt that nobody wants to see paid down, the freezing of home equity line levels at way below home market value, and the disallowance of any type of loan that is backed with actual tangible collateral, also known as "sweat equity". Why grant someone to a loan that is backed by their own 10, 20 or 30 years of home equity collateral when Chase Bank can use the three methods mentioned above to put that customers entire credit rating in peril and perhaps create a chain reaction in which they lose their home? It appears to me that banks have raised credit card interest rates, lowered home equity lines it unfair levels, not allowing collateral back loans as they appear to be waiting out people who otherwise would not have buckled financially if the Banks and Barack Obama had not gamed them. (edit note, well it looks like I beat the AP, which has now released a story that starts with the following opening paragraph), CLICK ON IMAGE TO ENLARGE. 7 hours AFTER this article was first posted, the AP HEADLINE UP ABOVE along with their first paragraph has an almost identical first paragraph message as my own headline...I kid you not. FREEPRESS.net needs your help in regards to keeping your internet flowing fast and affordable. CLICK HERE to SEE and SIGN the FCC PETITION. Apparently, Free Press dot net has one lobbyist in Washington while the big internet service providers have over a hundred. Why this may be important to you is the insatiable appetite corporations have to make more and more profits, or fire the people who can't make higher and higher profits for them and higher bonafide jerks who can. What could happen over time is internet service gets stratified into several layers, each layer with a cost point and of course, better and faster service the more one is willing to spend. I'm not saying that will happen, however, would you be surprised if it did? The United States is presently 22nd in providing broadband to its citizens. lol, We're number two, twice! And, our service is considered slower than many other countries that we would consider ourself equal to in the internet world. A couple of analogies to consider, arbitrators tend to favor whomever hired them, food processing inspectors tend to favor whoever hired them, and if internet service providers don't have any bonafide consumer groups opposing them, they probably will get rules and guidelines passed that favor themselves over the consumer. 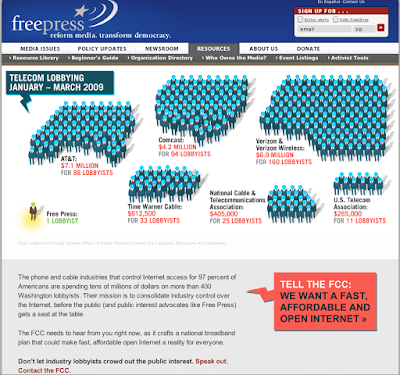 I don't personally know freepress.net, but I thought they make a compelling case for internet representation. MUCKETY dot com, a way to TRACK RELATIONSHIPS of our ESTEEMED POWER BROKERS and the Companies they do Business with. I just stumbled upon this site called Muckety dot com and thought it could be an interesting way for us PUMA's to discover business relationships that may help explain public behavior and policy that affect all of us. Here is an example of how the map can look. 50 teens allegedly attack white family in front of their home while shouting racial epitaphs. The aspect that I find strange is where did the kids come from, and where did they go to afterwards? I also am perplexed at what appears to be the lack of damage to the home or yard, that many kids jumping around for a few minutes and you would think some obvious home vandalism would have ensued. Marty Marshall was obviously hurt as he spent four days in the hospital. Why is Barack Obama everywhere but where he should be? Barack Obama's Magical Mystery Tour, the Wrong Place, the Wrong Time. What Can Barack Obama possibly say to anyone, anywhere in the world that can matter more than working on making America better? If Barack Obama's plan is to reassure the world that America will be OK, how can he know that if he leaves the financial duties to corrupt bankers who only care about themselves, first? Barack Obama's trust in ACORN is misguided if ACORN doesn't come to the aid of the 2 million Chase bank victimized customers who are going to have their credit ratings damaged or who will simply give up and not pay the 2% to 5% Chase Bank payment increase, scheduled to hit on August 1st, 2009. These Chase customers, the creme of the crop customers who are never late on their payments, will go further into debt because of the demented and illogical belief system of Chase Bank board of directors Jamie Dimon. Time for Barack Obama to head for home and feel real pain, pain the banking industry is intentionally causing, pain Barack Obama never felt when he and Michele were galavanting to Bali to write a book about his deadbeat, passed on father while his mother lay dying of cancer in Hawaii. Check out what a Barack Obama supporter is saying, Banks Betray Barack Obama. Where is Hillary Clinton, we need her here in America, now more than ever. What I Wrote about Jamie Dimon of Chase Bank that HUFFINGTON POST WOULD NOT POST in the COMMENTS SECTION. (Edit note). To be fair, Huffington Post DID print an earlier response of mine to that same thread. Chase Bank board of directors Jamie Dimon is speaking moronically when he states that Chase Bank is trying to "help" two million Chase Bank customers pay down their low interest rate debts as fast as possible by raising the monthly minimum payment required from 2% to 5% on LOW INTEREST RATE, LIFE OF THE LOAN credit card agreements. I am not privy to the exact numbers, but the approximately 2 million Chase Bank customers with amazingly good payment histories will be (adversely) affected by Chase Bank's unilateral, me first, scorched economy, 2% to 5% raise in the monthly minimum payment. Chase Bank customers will LOSE BETWEEN 100 MILLION to 1 BILLION DOLLARS A MONTH as they are forced to increase payments on low interest Chase Bank loans while DECREASING PAYMENTS on HIGHER INTEREST RATE LOANS. This 100 million to 1 BILLION DOLLARS of pilfered money will be diverted from local economies all over the country into the pockets of Chase Bank executives addicted to their obscene bonuses.Dimon's advocacy of the 2% to 5% raise in the Chase Bank monthly minimum payment requirement on low interest loans just proves he is incompetent, doesn't know what he is doing or saying, and should step down in these trouble economic times before he irrevocably ruins more lives than the number of breathes he will take even if he lives to be a hundred. Why is Huffington Post AFRAID to print the above comment? Why? Is the answer that the well known all protect each other, even when comments they attempt to conceal are truthful and if publicized properly could help save thousands of people from losing their homes? CREDIT CARD COMPANY "ME FIRST" APPROACH CREATING MOUNTAINS OF PAPERWORK & COURT TIME FOR EVERY COUNTY IN THE US, BUT IT IS SO MUCH WORSE THAN THAT !!! Update Oct. 18, 2017. Please have NO MERCY for credit card companies. Credit Card Companies get to charge interest rates that are 400% to 500% more than a typical mortgage rate because their debt is allegedly unsecured, but if a credit card borrower cannot pay their minimum payment every month, the alleged unsecured debt is then SECURED in court! This is one of the all time outrageous Financial Terrorism stunts ever perpetrated on the American People. Worse still, the 2% monthly minimum payment is credit card crack, designed to lure unsuspecting credit card customers into tens of thousands of dollars of debt before the customer realizes they will never be able to pay off their debt. If Credit Card Companies, from the first time a credit card customer was allowed to use a credit card, required a 5% or 10% monthly minimum payment, Very few customers would go into debt that they cannot afford to pay back. Instead Credit Card Customers are lured by the 2% monthly minimum payment into eventual credit card debt they will never be able to pay back, but the credit card is unsecured, so too bad for the credit card company??? WRONG! The credit card debt is then magically changed to a secured credit card debt by a Judge! Now the Credit Card Customer has to pay the newly secured Credit Card Debt as if it were a mortgage, meaning now the Credit Card Company can take a debtor's house after charging the Customer 500% more in interest than a mortgage. This is the very definition of Financial Terrorism. (End of Oct. 18, 2017 update). CLICK HERE TO SEE ARTICLE ABOUT ALL THE HIDDEN COSTS CREDIT CARD COMPANIES ARE EXPOSING THE COUNTRY TO. The Associated Press recently researched bankruptcy rates in states that allow credit card companies to garnish the wages of their customers versus states that do not. The states that allow wages to be garnished by credit card companies have a MUCH HIGHER RATE OF BANKRUPTCY than the states that do not allow credit card companies to garnish wages. The AP was able to compare two neighboring towns in bordering states with similar types of economies, one allowed garnishing of wages, one did not. The A.P. research uncovered a significantly higher bankruptcy rate in the town that allowed wages to be garnished by the credit card industry versus the town that did not. The much higher rate of Bankruptcy in wage garnishing states creates a chain reaction that would do a nuclear reaction proud. Wage garnishing by the credit card industry leads to increased Bankruptcy resulting in more state services, from welfare to court services to housing, food, psychological and re-education. Bankrupt people both require more state services and are more likely to ask for financial assistance from their state government at a much greater level than those who are still trying to get by. Credit Card Companies hit Garnished wage states in many ways. Not only do garnished states have MORE citizens NEEDING state services, they also have LESS PEOPLE remaining in the work force as well. Being bankrupted by a credit card company is not necessarily conducive to getting another job, so perhaps another approach is needed. Some employers won't hire someone who has filed for bankruptcy. The waged garnished states try to handle the overburden caused by increased personal bankruptcies by trying to raise taxes, this in turn draws the ire of the states citizens and small business owners still in business. Tea party protests then spring up protesting both local and federal governments. These tea party protests result in attention being diverted away from the real agitator in this situation, the credit card companies and their scorched earth collection methods that create increased personal bankruptices in states that allow them to garnish wages. Credit card companies are actually destroying the economy when they could be helping by offering INCENTIVES to people to pay down their debts rather than finding any excuse to punish them, (like forcing them into bankruptcy). What are you doing to help stop the credit card companies? COME & GET IT LAWYERS! CHASE BANK HAS 2.6 BILLION DOLLARS in RESERVE for LAWSUITS, no wonder Chase Bank does not seem to care about Public Opinion. Seems to me that Chase Bank keeps so much money in reserve (2.6 billion dollars), for fighting and settling lawsuits that they probably think they write the laws and enforce them as well. If you are an attorney and nobody has called you complaining about Chase Bank, you might just be a crappy attorney. 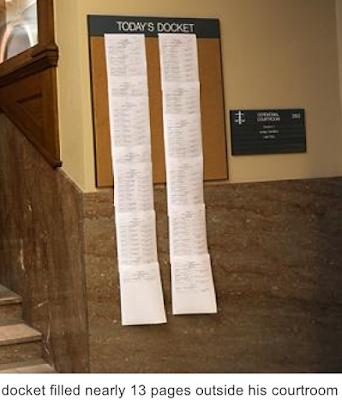 Over 1,000 CHASE BANK CREDIT CARD COMPLAINT LETTERS at CONSUMER AFFAIRS DOT ORG, NOT ONE FROM ACORN, is that POSSIBLE? (EDIT UPDATE NOV. 7TH, 2009 - IT IS NOT ENOUGH TO SIMPLY FILE A COMPLAINT WITH THE CONSUMER AFFAIRS LINK PROVIDED HERE AND BELOW. PLEASE DO FILE A COMPLAINT WITH THEM IF YOU BELIEVE YOU HAVE BEEN WRONGED BY CHASE BANK. It appears to me that not one ACORN member is complaining about the Chase Bank Credit Card Division's attempt to raise the monthly minimum payment from 2% to 5% on their low interest rate, life of the loan agreements on over a million of their most trustworthy and reliable, always pay on time customers. These low interest, life of the loan Chase Bank Credit Card agreements are only offered to people with an excellent credit history and who are never late on their payments. There are over one thousand letters of complaints against Chase Bank at Consumer Affairs dot org in just the past few months, and the number is growing on a daily basis, yet ACORN is nowhere to be found. And where is BARACK OBAMA? Kind of odd no? How can ACORN be so willing to fight tooth and nail against the home mortgage industry, yet not utter a peep against the thrashing that credit card debtors, many of who are home owners, are about to incur from Chase Bank come August 01, 2009? Could it be that once many of these "best of the best" always "pay on time" Chase Bank credit card customers default on their accounts because they can't handle such a huge and onerous raise in the monthly minimum payment, they may also watch their credit ratings plummet to the point where their homes may be become more susceptible to foreclosure? Is ACORN WAITING TO POUNCE on these one million plus Chase Bank Credit Card victims once they default on their loans? Or, is Chase Bank trying to default these best of the best of their customers so they pay higher interest rates in the future, ANOTHER WAY TO FEED THE THE ACORN MONSTER! HOW ABOUT BOTH! Read the letters at consumer affairs dot org to see just how devasting Chase Bank's actions are going to be to as many as one million of their credit card customers. When Barack Obama's wealthier presidential supporters still had plenty of money to give Barack Obama's democratic and presidential campaign, but had given the max they could give, wasn't it ACORN that buddied up with these wealthy supporters to increase donations in a questionable manner? Wasn't it the combination of ACORN and the wealthy with their unlimited credit cards who funneled credit card funny money donations to the tune of 10 million, 50 million, perhaps as much as 200 million dollars last year under names such as Donald Duck and Mickey Mouse? As we speak, it appears to me that while Hillary Clinton is sent round the world on behalf of the United States and Barack Obama, some of her supporters are being thrown under the Chase Bank bus. Until I hear a clear and loud denunciation from ACORN in regards to Chase Bank's raising of the monthly minimum payment on over a million of their most trustworthy customers by 150% with no OPT OUT option, I see the Chase Bank situation as a crisis that SHOULD PULL HILLARY CLINTON AWAY FROM BARACK OBAMA. FATWA against Homosexuality in Moradabad, India Announced by Muslim Clerics. Homosexuality was just legalized in India, then immediately greeted by an announcement of a Fatwa against homosexuals by Muslim Clerics. The main reason given by the muslim clerics is that homosexuality is against the laws of nature. Is out of control population growth a "law of nature" as well? lol, maybe it is. However, nature is full of examples of non reproduction due to homosexuality, or non reproduction due to a myriad of other reasons, such as eating one's young. Is it natural to eat one's offspring, or one's lover? Those acts go on in nature. Acts of non reproduction can actually prolong all life on our planet as it helps to control out of control population growth. If homosexuality were truly not a "law of nature", then it would take exactly one life span for all homosexuality to disappear from the planet. To paraphrase Groucho Marx, why would you force someone to procreate who may not want to be a member of the pro creating race? Wouldn't it be fascinating if we lived in a world where Muslim Clerics encouraged homosexuals to artificially procreate because they were the minority and their view of life should be preserved specifically because it was not the "majority view"? Maybe instead of a fatwa against homosexuals in India, a compromise could be worked out instead. Don't ask if someone is homosexual, and don't tell if someone is homosexual. ...and then there is...the judge who was forced to rule that a teenage girl's suicide is meaningless by giving no jail time to the adult that may have instigated the teens suicide. If ever there was a court case in which NO MEN should have been involved, no male judge, no male bailiff, no male jurors, no male attorney's, no male district attorneys, no men anywhere in the courtroom, the Lori Drew vs Megan Meier case might have been the one. It appears the prosecutors struggled with what to charge Lori Drew with, so now it appears the mother who appears to have cyber bullied her teenage neighbor with the help of her own daughters gets to walk away innocent of contributing to the teenage neighbor's death. Can men really handle a case that involved a mom creating a false teenage boyfriend who would dump her teenage neighbor who might, because the neighborhood teen girl might have been spreading rumors about faker mom's own daughters? I guess Lori Drew "suffered" wondering if she would go to jail, but was justice really served here? This AP Story link for some reason leaves out the actual final offending message that appears to have led to Megan Meiers suicide by grief. What I don't understand is why not go with a charge of internet use to cause emotional distress of a minor? Is that not a crime? What about stalking for purposes to inflict emotional distress? Another somewhat unique aspect in this case is the people involved knew each other and lived near each other. The close proximity enabled the Drews to pull off a much more elaborate hoax which appears to have contributed to the suicide of Megan Meier. It is one thing to create a fake character in an effort to deceive somebody else anywhere on the planet, but when the faker lives near the intended target and the faker's daughters can tell the faker what the intended target was wearing that day, or something she did during the day, that will just intensify the reality of the surreal situation that Megan Meier was caught up in. Maybe I have watched too many Law and Order Television shows, but why not charge Drew's daughters with day to day stalking for the purpose of emotional distress, then allow faker mom to accept a plea deal on a cyber bullying charge to keep her daughters from being tried? SOMEBODY DID SOMETHING WRONG, NO?